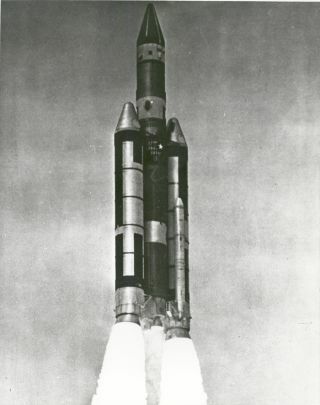 This launch vehicle, shown here in 1970, is designed to carry a payload equal to the size and weight of those on a space shuttles. In this historical photo from the U.S. space agency, a Titan III-C launch vehicle is launched in September of 1970. Titan vehicles are designed to carry payloads equal to the size and weight of those on the space shuttle. The Titan IV Centaur can put 10,000 pound payloads into geosynchronous orbit, 22,300 miles above Earth. For more information about Titan and Centaur, please see chapters 4 and 8, respectively, in Roger Launius and Dennis Jenkins' book To Reach the High Frontier published by The University Press of Kentucky in 2002.